December 1959: Walthamstow Guardian Newspaper Report on the Essex County ‘Youth Speaks’ Final – and the MDC second place success! This new item in the website shows the first batch of extracts taken from Les Smith’s – ‘A Headmaster View of Events’ – his ‘essay’ about his aims and experiences before and during his Headship of Markhouse Secondary School between 1957 and 1966 – somehow ‘acquired’ by Dickie Dunn and subsequently passed on by Vivienne for inclusion in the website – albeit not the whole 90 pages! The document also plots the lead up to the 10 years of his Headship – the philosophy that underpinned his aspirations for the school and its pupils, the massive changes in the structure of education that took place in the post wars years and the contributions of the staff over this period – plus the formation of the Drama Club (along with other community based groups) – in short, an account of ‘our education’ and what was going on behind the scenes! Further extracts will be added over the coming months and – for anyone interested in reading the full version leave a note to this effect on the Website Contacts page – as it is hoped that this will be made available in the not too distant future. AND – The COPPERMILL PUPPET THEATRE? The notes in one of the Drama Club programmes states that the Coppermill Puppet Theatre became an affiliated group – although no detail was given, or is currently known, about when or how this occured – or indeed, if they ever staged any of their performances at Mark House. At best it might be assumed that this happened at some time after Mr Malyon was transferred to Coppermill Seconday Modern School – post 1966! 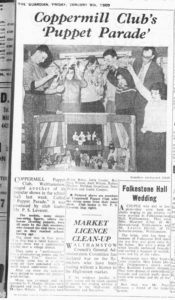 However, it is clear from this article from the Walthamstow Guardian Newspaper, dated January 1960, that the Puppet Theatre was in existence well before this – so, if this report, or the name rings any bells – then please get in touch through the website Contact Page to let ‘us’ know what ‘you’ know!